Simon Boss from Switzerland really loves the Poker EM in Velden. Two years ago he managed to win the main event and this year he became the first player to ever win this event for the second time. Simon is a successful entrepreneur in his home country with a company with 120 employees and he has poker as his favourite hobby. The win, which was made possible thanks to Simon’s ‘Velden Final Table Shirt’, was worth €142,000. 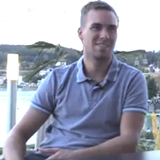 Simon talks some about the decisive hands of the tournament, the online poker ban in Switzerland, his plans in poker for the coming months and that he will for sure come back next year to Velden to defend his title. Note: The video we had posted here is no longer available. Péter Gál is a big fan of Velden -- this year was the first year that he won his way to the European Poker Championship in an online poker tournament, but it wasn't the first time he's played the Poker EM European Poker Championship. Last year his friend Daniel won a satellite tournament at Intertops Poker that awarded an all expense paid trip to the Austrian spa/casino resort. Since Intertops qualifiers can always bring a friend to the live events, Péter tagged along. Last year Daniel won an online satellite tournament at Intertops for the Punta Cana Poker Classic and they went to the Caribbean together. To even things out, Péter thought it was time to level the score and managed to win a satellite to Velden this year. 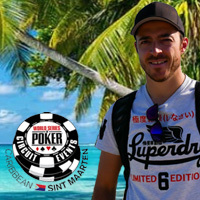 Peter talks to Rikard about being an online pro for nine years, his education, and his plan to win another satellite on Intertops and bring his friend Daniel to St Maarten in November. 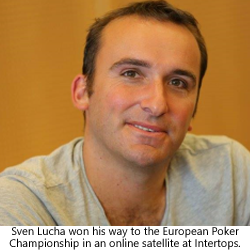 This was Sven Lucha's second European Poker Championship in Velden Austria. Although he didn't finish in the money, he enjoyed the tournament and his week at the posh spa resort and will, no doubt, be back again next year! Chipcounts leading up to day 3 of Poker EM Velden. Some players prefer to remain anonymous, hence only their first names or nicknames. 37 players through to day 3, 27 will get a minimum of €6,500 and the first prize is €142,000. Four online satellite tournament champions from Intertops Poker and Juicy Stakes Poker -- Sven Lucha, Joakim Lidberg, Peter Gal and Derek Nakafuji -- are in Velden, Austria this week for the €700,000 European Poker Championship Main Event. 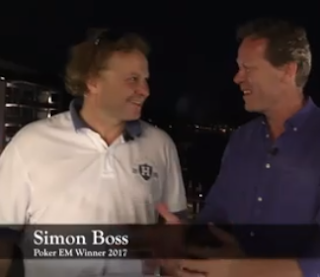 In our first video report from the posh casino resort, Rikard Ekberg catches up with Sven to talk about his strategy for Day 1 of the 4 day, tournament. Rikard will be back with highlights of the the Main Event Day 1 and interviews with Sven and the other Intertops Poker and Juicy Stakes Poker players throughout the event. Online satellite tournament winners from our sponsors, Intertops Poker and Juicy Stakes Poker, are on their way to Austria next week where they’ll compete in the prestigious Main Event of the European Poker Championship in Velden. Video reports from the tournament, featuring interviews with the players, will be online beginning July 27th. They each won a $4000 prize package that includes €2700 buy-in to the EPC main event (July 27th to 30th), accommodation at a premium hotel close to the casino and cash for travel expenses. This year the EPC Velden prize pool is estimated to be over €700,000 (over $770,000). Players from all over Europe (especially Germany and Italy) will play tournaments and cash games on more than 40 tables at the exclusive lakeside resort. Derek, a professional poker player from Los Angeles, California, also won an online satellite tournament at Intertops Poker and will be joining Sven in Austria.